Starting with something a bit strange, can you explain what your pseudonym means or refers to? There is an origin to the name AUN, but it does not translate very well from french. It was chosen because it felt like it fit well with the type of music, a bit mysterious and non-descriptive. Part of the appeal is the mystery, so we never fully explain the name. Do you feel AUN as Martin Dumais' musical soul? What is the relationship between your life and your music? I live and breathe for music, and AUN is my current vehicule to explore any musical terrain I choose, but it has also taken a life and soul of its own, and I now feel it is in part directing itself, so I can sit back and enjoy the trip, and with each release, Julie's input grows more, so its not just about my soul anymore. Talking about your last album, we can say thats probably your most “clean” one, your most serene one and – but that's less important - my favourite one. Do you see it as the ending of a process that started with your arrival at Denovali? Our releases on Denovali cover a wide palette, but the music is never created to fit any labels directions. Since the first Denovali release AUN has become softer with each new release, but it is definitely the end of a cycle, since we are fast moving into new directions. Can you tell a bit about its gestation? It was the longest time spent assembling an album, over 18 months. Partly because we travelled a lot and I wanted a more live approach to recording, so getting enough material took a bit more time then usual. Did you want to get to something particular with “Alpha Heaven”'s music? If you peel away the distortion, a lot of our music is very melodic, and I wanted keep the music on "Alpha Heaven" from being clouded by effects and noise and just let the music shine. This was actually the most difficult part, because I like cloudy obscured music a lot. I noted also something particular about the titles... They are written in different languages. What does they refer to? Do you see your music as an “international” language that oversteps genres and definitions? I don't aim to overstep, but I love the possibility of creating something new by not having a rigid language and musical direction. This certainly accounts for the fact that AUN often sounds otherwordly and maybe even extra terrestrial. In your first albums you goes much more close to dark territories. Your music looked like a voyage between metal/doom sounds and ambient atmospheres... Now, you work much more with drone. How has this gradual change in your musical universe developed? For personal reasons, I was not in a very good mood when I started AUN, so that certainly accounts for the heaviness and darkness of the earlier releases, but using less and less 'straight' guitar with each new recording as changed the sound to a large extent, and opened a much larger sound universe. As Sun Ra said: "Space is the Place". I was recently watching a great BBC documentary on the origins of krautrock, and one of the german musicians interviewed mentionned that in order to create something new, they did not look to british or american rock, but to the heavens. This is something that is true for me also, as I get most of my inspiration from the not so tangible like space, time travel or non visible dimensions. After Oral, Denovali has become a sort of home for your records, after a period where you jumped between other labels... How do you get in touch with them? And why do you choose to settle your music into their catalogue? In 2010 there were several releases on different labels, but that was not really planned, a few offered to release AUN like Cyclic Law and Drone Records, and at the same time I had sent some material to Denovali who responded positively, so this just sort of happened. Has this new artistic “marriage” influenced your music? Not really, the music just mutates organically. What instruments do you use when you play in studio? And has your instrumentation changed along with your soundscape? Recently we have been using more and more hardware and virtual synths than guitars, and a drum machine has recently made its first appearence in a long time. What artists, from both past and present, represent sources of inspiration for you? Brian Eno, Edgar Froese, Chris Carter and currently a lot of the releases on the Blackest Ever Black label and uk act Emptyset. Talking about live shows, how do you usually build them? 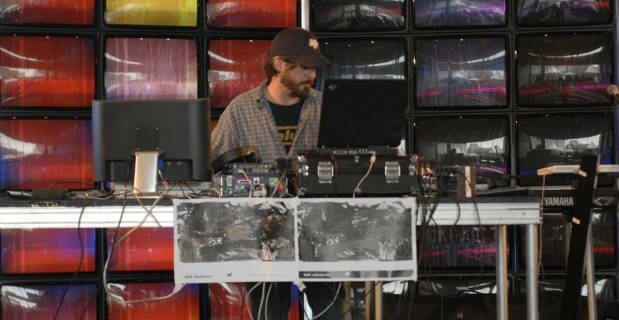 Hard to pinpoint, there have been at least a dozen different live set ups in the last six years. The gear and current interests partly dictate the shows. An important role is fulfilled by visuals. How do you choose them and how are they related with music? Knob twiddling live electronic artist can be be a bit boring, so its nice to sometimes be able to offer a full audio-visal experience. Julie creates most of the videos, and just like the titles, she lets the music dictate her impressions, in a process which I would qualify as sound and image sculpture. We recently played a show in the usa, where we were facing the screen and reacting to the images like live sountrack scoring, which proved to be an interesting experience that we will certainly try again in the future. I was a label and magazine art director for a long time, and some of that experience is applied to the visuals and artwork. I tend to keep things clean, simple and minimalistic. What are your plans about live performances for “Alpha Heaven”? "Alpha Heaven" is not an easy album to recreate live, but we will play some adapted parts of it during the next tour. Is there any chance to can see you in Italy during the next months?